Picturesque 48+ ac. 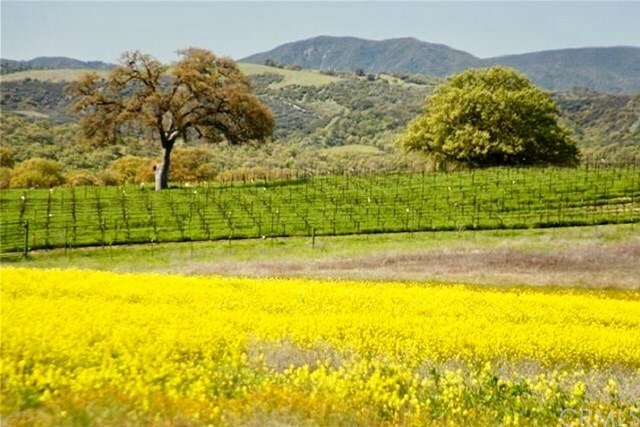 parcel ideal for the gentleman rancher or vineyard estate. Located in the heart of San Antonio AVA wine corridor. Surrounded by vineyards, ranches, olive groves, & lovely homes. Flat to gently rolling land accentuated by scattered oaks & stunning elevated panoramic view site w/plenty of space for a new home, paddocks, riding arenas, pools, tennis courts, & more! Zoned RG/40 (Rural Grazing) which allows for up to 3 homes on the property & a myriad of agricultural uses. There is an existing older, but permitted, manufactured home on a foundation prime for a replacement permit to speed up the building process. Water is plentiful & of great quality as this parcel is within the Lockwood Valley Groundwater Basin. There are 2 wells including an older ag well w/10,000 gal. water storage tank & several concrete water troughs, plus a newer domestic well. There is power on the property including 3-phase for a shop, equipment, irrigation, etc. The fertile soils consist of Nacimiento Silty Clay & Silty Clay Loam. 11 acres were certified organic in 1987. The climate is similar but slightly milder than Paso Robles due to the coastal and San Antonio Lake influence, ideal for grapes with other local wine grape growers cultivating 20+ varietals within the AVA. All-weather access is easy, minutes from Jolon Road and about 15 min. to Hwy 101 at Bradley. Close to San Antonio Lake’s North Shore & a short drive to Fort Hunter Liggett, Lake Nacimiento, Paso Robles & King City.